We are a leading Exporter of fiprovet 0.05 % gel, bromadiolone 0.005%, temephos 1 % sg and lambdacyhalothrin 10 % wp from Pune, India. 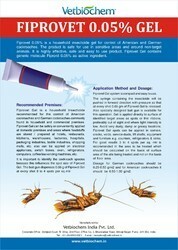 Fiprovet 0.05% is a household insecticide gel for control of American and German cockroaches. The product is safe for use in sensitive areas and around non-target animals. It is highly effective, safe and easy to use product. Fiprovet Gel contains generic molecule Fipronil 0.05% as active ingredient. Fiprovet Gel can be safely or conveniently applied at domestic premises and areas where foodstuffs are stored / prepared at hotels, restaurants, kitchens, warehouses, factories, hospitals, packaging industries, textile industries, shopping malls, etc. also can be applied on electrical appliances, switch boxes, oven, refrigerators, computers, coffee/tea vending machines, etc. The syringe containing the insecticide will be pushed in forward direction with pressure so that at every shot 0.05 gm of Fiprovet Gel is released. Also specially designed bait gun is available for this operation. Gel is applied directly to surface of identified target areas as spots or thin ribbons, preferably out of sight and where light intensity is low. Avoid very dusty, damp or greasy locations. Fiprovet Gel spots can be applied in corners, cracks, voids, service-ducts, lift shafts, equipment and furniture e.g. counters, refrigerators & sinks. For good results 3 to 4 spots per sq. mtr is recommended in the area to be treated which should be calculated on the basis of surface area of the site being treated and not on the basis of floor area. Dosage for German cockroaches should be 0.25-0.50 g/m2 and for American cockroaches, it should be 0.50-1.00g/m2. 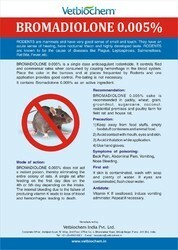 BROMADIOLONE 0.005% is a single dose anticoagulant rodenticide. It controls filed and commensal rates when consumed by causing hemorrhage in the blood system. Place the cake in the burrows and at places frequented by Rodents and one application provides good control. Pre-bating is not necessary. It contains Bromadiolone 0.005% as an active ingredient. BROMADIOLONE 0.005% does not act as instant poison, thereby eliminating the entire colony of rats. A single rat after feeding on the first day dies on the 4th or 5th day depending on the intake. The internal bleeding due to the failure of producing vitamin K leads to loss of blood and hemorrhages leading to death. Recommendation : BROMADIOLONE 0.005% cake is recommended in paddy, wheat, gram, groundnut, sugarcane, coconut, residential premises and poultry farm for field rat and house rat. Precaution : 1) Keep away from food stuffs, empty foodstuff containers and animal food. 2) Avoid contact with mouth, eyes and skin. 3) Avoid inhalation while application. 4) Use hand gloves. Symptoms of Poisoning : Back Pain, Abdominal Pain, Vomiting, Nose Bleeding. First Aid : If skin is contaminated, wash with soap and plenty of water. If eyes are contaminated, flush clean water. Antidote : Vitamin K If swallowed, induce vomiting administer. Repeat if necessary. 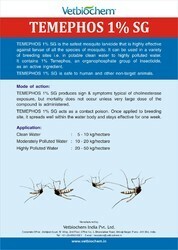 TEMEPHOS 1% SG is the safest mosquito larvicide that is highly effective against larvae of all the species of mosquito. It can be used in a variety of breeding sites i.e. in potable clean water to highly polluted water. It contains 1% Temephos, an organophospate group of insecticide, as an active ingredient. Temper SG is safe to human and other non-target animals. TEMEPHOS 1% SG produces sign & symptoms typical of chlolinesterase exposure, but mortality does not occur unless very large dose of the compound is administered. Temper SG acts as a contact poison. Once applied to breeding site, it spreads well within the water body and stays effective for one week. 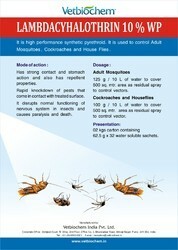 It is high performance synthetic pyrethroid .It is used to control Adult Mosquitoes , Cockroaches and House Flies . Looking for Rodenticide Products ?